I just posted a new Timeline 3D update to our website. This release includes stability improvements for very large movie exports. For example, if you are exporting a timeline at full HD 1080p resolution with several hundred events and all the cinematic featured turned on, you will no longer need to cross your fingers. I have run all our “torture test timelines” on this release and it is definitely the most stable release to date. We also continue to work on translating the software for our customers worldwide. In particular French and German have major improvements in this release. I am having all sorts of problems. The most pressing is I am receiving error messages saying the document can't be saved and/or another application has modified the file since I last saved or opened. I've tried a fresh install but to no avail. This may or may not be Dropbox related so I'm working from my Desktop and saving and hoping. I haven't had this issue with other programs and Dropbox. The second issue is that events sometimes add to the row I want, other times they do not. Copying/cutting pasting from the incorrect row to the correct row doesn't fix it either. I am in the bulk edit screen when this happens. A work around is to drag the event to the correct row in screen view but it's not really the most efficient way to do it. Are these known issues? I've also sent an email with a screenshot. I'm sorry to hear that you are having some saving issues. Can you send me an email at elise@beedocs.com so that I can look into the issue and work with you to troubleshoot? There may be a number of different things here, and beginning an email correspondence will allow me to better help you. I'm having very similar issues, so responding on this site would be helpful if you resolve JP's problems. I purchased the software because within the free downloaded version, I wasn't able to save my timeline in either PDF or .bdt format. I am still not able to save my timeline in either format. Any idea why this is happening? Thanks. In order to better troubleshoot, I need some additional information from you. I am not sure if you and JP are experiencing the same problem. It would be great if you can tell me what you tried to do, and what happened instead. Relaying any error messages you received will help me to try to resolve this. Email will be the best place to work this out, so please send me an email at elise@beedocs.com. I will do my best to help you resolve this. If we find an issue that is affecting a number of customers, we will post tips for resolution here on the blog. Just loaded the new version and I keeps defaulting to the current date and time for each new entry. HELP?!?!?!?! LABO - We discovered this bug a few days ago. It seems to affect events that have times showing ("date only" events are working). This bug is my top priority today and I hope to have an update published very soon. I am sorry for the inconvenience. I've just updated my OS to Lion and am now unable to view my timelines in 3D. The program freezes and then reverts to the edit screen. Am I doing something wrong or is this a bug? 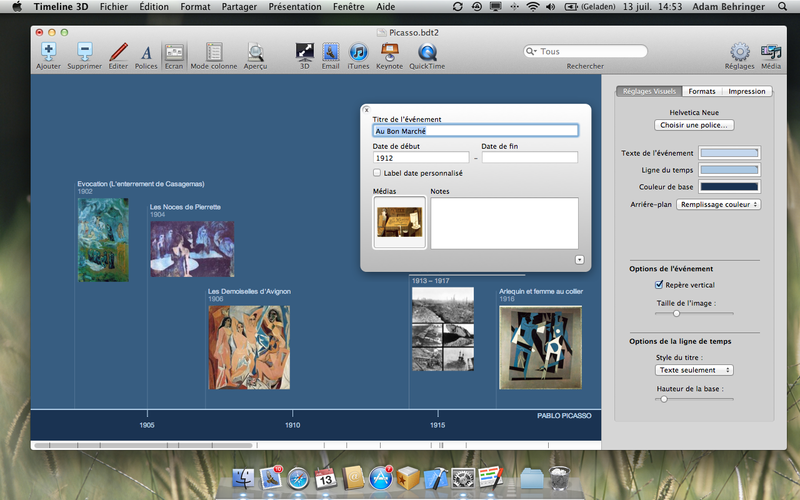 Mr Greve, We have not heard any other reports of 3D mode not working in Lion. In fact, this is one of the smoothest OS upgrades we have experienced. Please contact us at support@beedocs.com. We will get some more info from you and see if we can figure out what is going on. FYI- The bug reported by LABO (dates with times were not parsing correctly in Lion) has been fixed as of Timeline 3D (v3.2). Run a "Check for Updates" to upgrade for free.